There are over 40,000 veterans in Kern County, and for many, post-traumatic stress is a constant daily battle. Ketamine is an old drug that is being used in a new way to help veterans dealing with the trauma they've experienced. Jason Geis, a retired Sergeant Major in the U.S. Military, is a leader in the veteran community. He is a flight leader for the Kern County Honor Flight, executive director for the Portrait of a Warrior Gallery and a founding member of Wounded Heroes Fund. For nearly 21 years, he served as a Surgeon Sergeant Major in the U.S. Army, where he was in charge of training over 21,000 paratroopers. He also served in Iraq and in several overseas humanitarian and peacekeeping operations. But one of his biggest battles he's facing today is post-traumatic stress disorder (PTSD). Through the recommended six treatments of Ketamine infusions, Geis says the treatment was successful and he was able to find a sense of peace he hasn't felt in 21 years. 23 ABC followed Geis on his journey through this experimental treatment, that repairs and rebuilds damaged connections in the brain to help heal the mind and lessen the symptoms of PTSD. Ketamine has been used as an illegal drug before, and currently still used as a child anesthetic. In 2011, it started picking up momentum to treat depression and is also used for acute suicidal ideation. With the large population of veterans in Kern County, Dr. Jan Trobisch, the medical director for Synergy Wellness, wanted to introduce the treatment here in Bakersfield. According to medical professionals, Synergy Wellness is the only clinic that is offering this Ketamine treatment in Kern County . For more information on Ketamine, Dr. Jan Trobisch sat down for a Q&A. Answering questions like Ketamine's history of being abused? What are the risks? How many treatments do people need? Is Ketamine a cure? Before the first treatment, Geis says in his first interview the only thing he was concerned about was feeling ill. Geis shares his thoughts before the first treatment. Joel Moreno, chemical dependency counselor at Synergy Wellness was in the treatment room with Geis for each of the six treatments monitoring his vitals. As a veteran himself, he said it's important to him to help as many veterans as he can. Geis says the treatment really worked for him and shared his final thoughts including advice for those interested in the treatment. 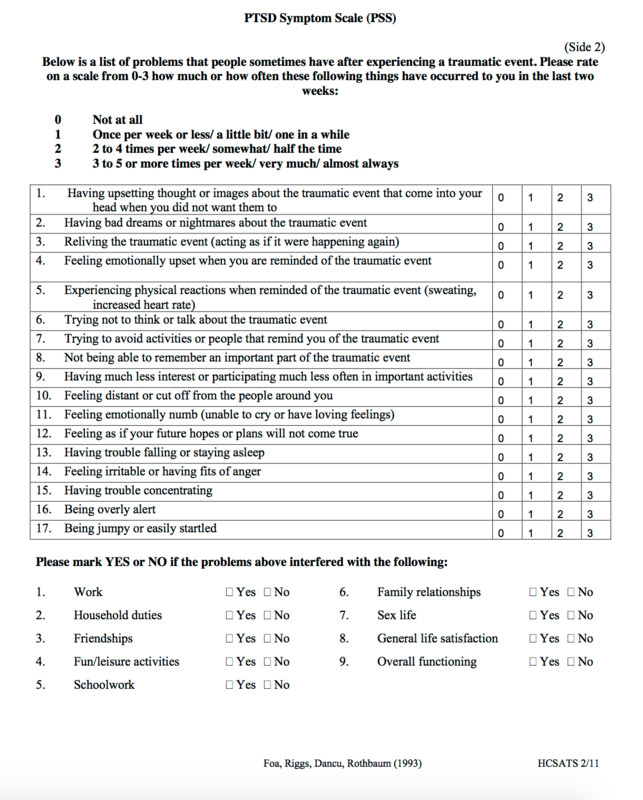 Before each session to observe and record the changes the treatment has on each patient, Dr. Trobisch asks each person to fill out a PTSD Symptom Scale (PSS). According to Moreno, a score 13 and above means you are dealing with PTSD. Within six treatments Geis's score went from a 35, which is severe PTSD, to a 13. If you feel you are suffering from PTSD, you can take this test to learn more. For more information on the Ketamine Treatment, contact Synergy Wellness.